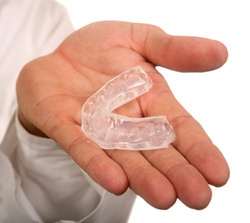 Custom mouth guards, worn at night, can help manage tooth grinding. Many patients, both children and adults, grind their teeth at night. This phenomenon, called “bruxism,” is very common: some clinicians believe that all adults grind or clench their teeth at one time or another. It may cause minimal symptoms, and a patient may not be aware of their condition. Topic 1: What Causes Teeth Grinding? Although the exact cause of bruxism is unknown, most clinicians believe that bruxism is usually associated with stress. Many patients grind their teeth as a way to deal with anxiety, fear, frustration, or anger. In addition, bruxism is habitual, so that patients who have been bruxers will most usually continue to do so. Another factor that may cause grinding or clenching can be a misalignment of the bite, so that bruxism is sometimes referred to as an “occlusal,” or bite, disease. Topic 2: How Do You Treat Bruxism? Once we have diagnosed the problem, we may recommend a night guard (bite splint”) that is custom fitted to your mouth. This device limits your ability to clench or grind your teeth, and may relieve some of the other symptoms, like headaches or muscle fatigue. We do not recommend over-the-counter night guards, as they may make some symptoms worse. In addition, there may be exercises or medications that may help relieve the symptoms. Call us to schedule an appointment to find out whether you have a concern or not. At Ian Barwick, DMD we’re here to ease your pain and your symptoms!